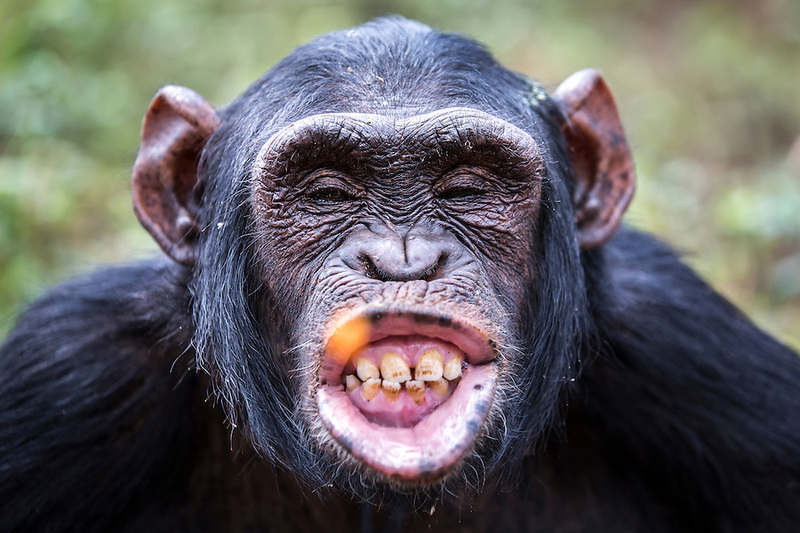 Female chimp, Medina, is photographed at the Ngamba Island Chimpanzee Sanctuary in Lake Victoria, Uganda. Medina is a relatively tall chimp with a pink- brown face and little hair at the back of her palms; because of constantly sliding on the floor during play time. Medina is very creative and spends most of her time observing so she can learn from her environment. At arrival, her canine teeth had been removed and the front teeth smashed. She was malnourished with a big and hard stomach which was believed to have worms. However, she was treated and she has recovered steadily. Medina is a very calm, friendly and generous chimp. Among the four babies, she is the only chimp who enjoys the company of humans. At the moment is learning the use of tools like sticks to retrieve food that falls under the fence line. She is fond of clapping and swinging her hands when asking for food or anything of her interest and also complains when given less food. Whenever she sees anything from a point where she cannot reach, she will always clap while whimpering at any person nearby to get it for her.